It is Time! 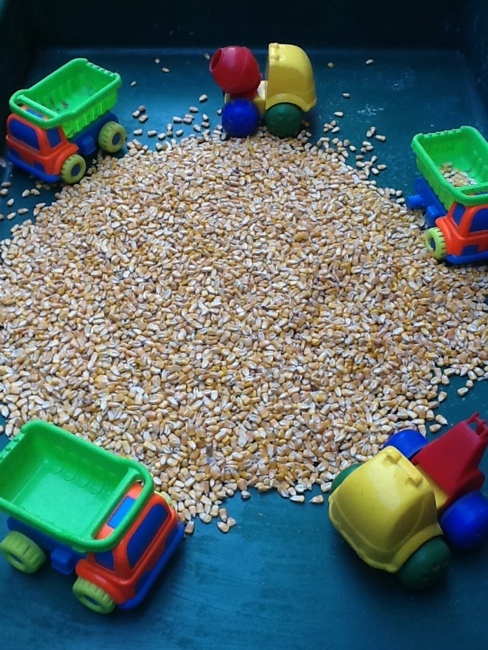 Time for yet another Sensory Bin Challenge, and this months material is corn! Why play with Sensory Bins?Sensory bins are a great tool for kids to experience the feeling of different kinds of materials. This is especially nice for the tactile seeking kids. It has a calming effect, helps to expand attention span and usually involves creative thinking and problem solving skills. We used whole kernels, like in chicken feed, because it is a bit bigger than popping corn so no chance they would stick it up their noses, lol! 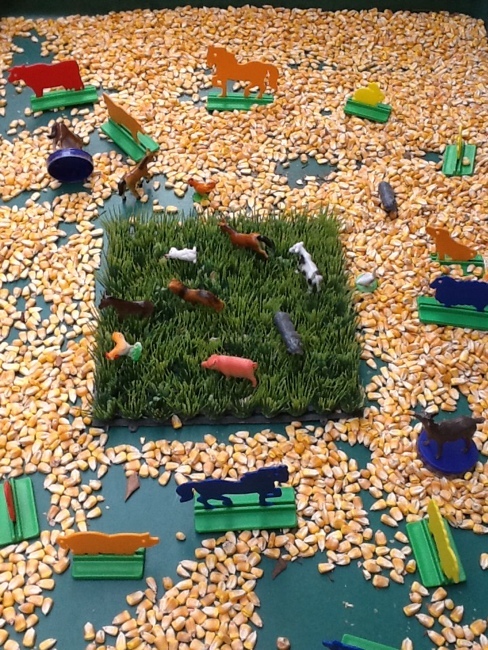 I ask the kids in my class(4 to 6 year olds) how they want to play with the corn, and their first reaction was: with the animals. We did this a while back when our theme was farming. So this time I wanted them to choose something different, and this time it was cars. We do not have small cars(those tend to disappear too quickly) so these bigger truck-type of cars had to work. And it did! They added the spoons and cups the following day and continued to play. Imagining it was a construction site, a farm etc. Sensory play at its best: child-led and full of playful learning opportunities! Love it! My 2 year old would love to get his cars involved in this!